It’s a question Dr. Mona Beylin hears frequently: When should I take my son/daughter to the dentist for the first time? While you may think the answer is somewhere between toddlerhood and preschool, there’s more to the story. When it comes to the first dentist visit age that Lowell parents are curious about, Dr. Mona, founder of Kangaroo Smiles Pediatric Dentistry, can provide a full answer (and more)! What is the First Dentist Visit Age That Lowell Parents Should Follow? While many parents naturally suspect that their child’s first visit to the dentist should be on the advent of a full set of chompers, the actual first dentist visit age that Lowell pediatric dentist Dr. Mona suggests is soon after the arrival of the first tooth. Dr. Mona’s recommendation is in sync with the American Academy of Pediatric Dentistry (AAPD) and the American Dental Academy (ADA) guidelines that recommend for children to be seen by a dentist before or close to their first birthdays or after the arrival of the first tooth. The earlier your pediatric dentist can assess the development of your child’s teeth, the better the chances of being able to prevent any potential problems (thumb-sucking or teeth grinding) from interfering with the natural growth of your child’s teeth, jaw, gums and mouth. Thank goodness for the malleability of young children! Introducing your child to his/her dentist while still in the stages of late infancy or early toddlerhood will help establish familiarity and a sense of comfort. 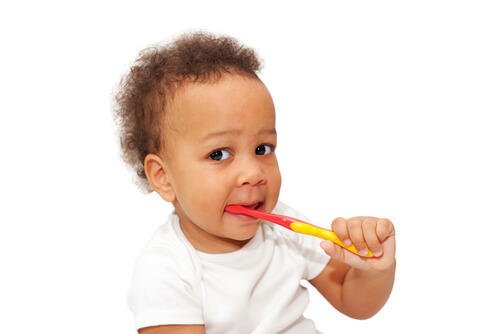 In addition to getting your little one used to sitting in the dentist’s chair, regular check-ups beginning at an early age will help solidify lasting healthy oral hygiene habits for years to come. While visiting the dentist for the first time at an early age will be beneficial to the comfort and health of your child, it will help you too! At Kangaroo Smiles, we cherish the opportunity to educate parents on best oral hygiene practices for kids to implement at home. If you’re ready to schedule a first pediatric dental visit at either of our child-friendly, bright and happy office locations in Lowell or Methuen, we’ll help you find the perfect time (whether it is before or after nap time)! Or, if you have additional questions regarding the first dentist visit age that Lowell parents ought to know, call us today: (978) 425-1496!